Engage your shoppers with targeted messages. Email is an ideal channel for putting your most popular products and best promotions in front of interested shoppers but the inbox is a busy place. You need strategies to stand out from the crowd and creative that will get clicks. Understanding your subscribers and what they shop for on your site will make email a channel that drives sales online and in stores. Move from “blasting” email to targeting subscribers based on their activity. We help retailers segment their list based on opens, clicks, and purchase data. We take it a step further by implementing trigger emails based on what a shopper looked at on your site. Successful furniture retailers use emails to help move shoppers from leaving an item in their cart to making the purchase. Design your emails to be most effective wherever they are read. 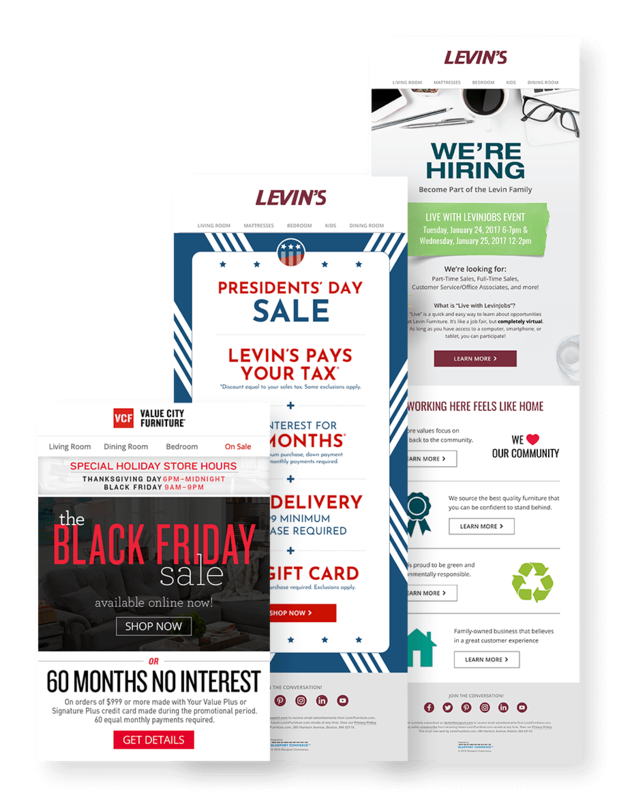 We design emails that work across the many mobile devices where emails are opened by shoppers. Our team’s experience with deployment, from coding to send time optimization, will help you make sure that you’re reaching the inbox with the best chance to be seen by your subscribers.